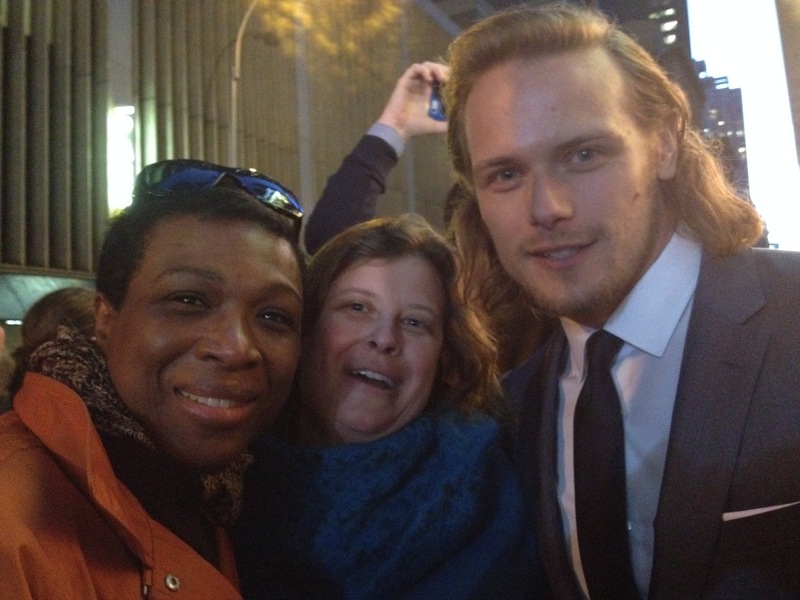 Outlander Mid-Season Premiere (NYC) – What are you reading? 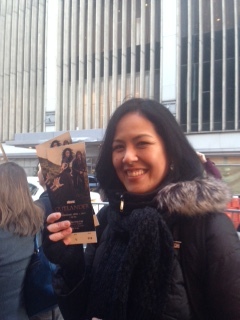 Once upon a time, there was a young lass (well, semi-young) who wanted nothing more than to attend the Outlander premiere in that great place called New York City. She emailed, begged and pleaded for someone, anyone to give her a ticket. But alas, it was not to be. Yeah right! Thanks to my friend being in the right place at the right time, we were in there! 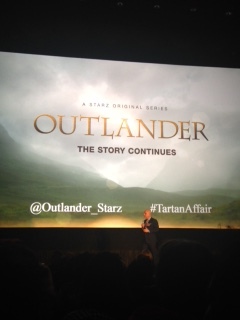 Yes folks, I attended Outlander’s mid-season premiere on, of all days, April Fool’s Day, but the joke was not on me. Because I saw the Holy Grail of Scotland, also known as Sam Heughan, in the flesh. Jamie Alexander Malcolm MacKenzie Fraser, the red-headed hero of Diana Gabaldon’s massively popular book series, now a massively popular television series on Starz. Looking at him was like looking at the sun, going blind and then having your sight restored, only to go through the process all over again. Only better. And taller. And prettier. And, wait, what was I saying? By this time, my lucky friend Patricia had been given tickets to the event and we were discussing her good fortune while standing closer to the interview tent when none other than Tobias Menzies (pulling double duty as Randall relatives Frank and Captain Black Jack) strolled by with his people. He was so close I could have grabbed him and never let him go. But since I wanted to actually make it into the premiere instead of spend the night with New York’s Finest, I decided against it. Television does not do that man justice. 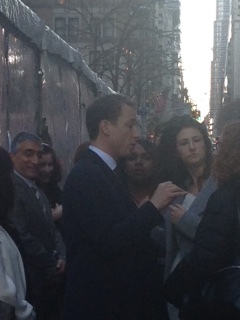 To give you an idea of how close I was to Tobias, see the proof. I could have touched his hair! As my friends and I tried to recover from seeing Tobias, we contemplated who would be attending the premiere. You see folks, Patricia was given only two tickets and there were three of us. Alison, ever the gracious lady, stepped aside so I could go. But don’t feel sorry for her just yet. Because before the night was through, Ali would give us both an epic middle finger. And then it happened. I saw a flash of red and turned just in time to see Sam walking towards us. He was dressed in a blue suit, red hair combed back and that beautiful smile on his face. In an attempt to get her to turn around, I almost broke Patricia’s arm in the process so she wouldn’t miss him. Again, he walked right by us, just as Tobias had only minutes ago. Unfortunately, getting to Sam was much harder so that was as close as I could get. The fans across the street who couldn’t make it inside (the ones I stupidly called suckers) were treated to photos, handshakes and hugs when Sam walked over to them. He was very gracious, talking to as many fans as possible, even climbing over the guardrail so he could take photos with a couple of fans in wheelchairs. What a guy! The only Outlander star we didn’t see was Caitriona Balfe (Claire Randall Fraser). I’m not sure if she walked by us with Sam because, well, all I saw was Sam! We wouldn’t see Caitriona until later on in the evening. She wore an amazing purple dress that hugged her curves and looked absolutely amazing. She may be a slim woman, but she knows how to work a dress. The premiere was held at the famous Ziegfeld in Manhattan, which is a fantastic theater to watch a film, or in this case, Outlander. Each theater contains a very large screen, almost like an IMAX, but the rooms themselves have more charm. There is no stadium seating, but plenty of comfortable seats and a balcony for a great viewing experience Fans of the show were treated to free popcorn, soda and water, photo opportunities with gorgeous men in kilts and the chance to meet other fans of the show. The mood was extremely festive, which lasted throughout the entire evening. Before the lights went out, Ronald Moore, the show’s creator, said a few words to the audience. He sent his apologies from Diana Gabaldon, the author of the Outlander book series, as she was unable to attend. He also thanked everyone for their support of the show and mentioned that a Q&A with the cast would follow the screening. By now, most of you have already seen Episode 109-The Reckoning, probably more than once. And I’m sure you agree that it did not disappoint. The episode was from Jamie’s point of view, which was a nice change. Although Claire was the one who fell through the stones, seeing and hearing about this strange situation from Jamie’s perspective was interesting. His faceoff with Captain Randall while trying to rescue Claire was amazing. Tobias Menzies is positively scary as the sadistic Black Jack and I am definitely looking forward to seeing more of him in the coming episodes. Since I am not one for spoilers, I won’t go into too much detail about the episode for those who have not seen it yet (seriously, what are you waiting for?). But I will say that Mr. and Mrs. Fraser are not your ordinary couple. Yes, they love fiercely, but damn can they fight! Neither one holds back and will say what they must to make their points. Jamie’s “punishment” of his wife was one of the funniest scenes I’ve seen so far on the show. And yes, the passion between Claire and Jamie is just as hot as ever. H.O.T. And that is how you give your friends an EPIC middle finger. Well played, Alison. Well played.